In this review, we’re going to check out the Brondell S1000-EW Swash 1000 Advanced Bidet Elongated Toilet Seat. We will take a look at the features of this electric toilet seat and why it ranks high on Amazon listings. We will also see what the customer opinion of the bidet toilet seat is and if there are any discounts, bonuses or savings when buying this seat. By the end of this review of the brondell S1000-EW Swash 1000 Advanced Bidet Elongated Toilet Seat, you will all about the pros and cons of this seat, if it’s worth the money from quality and durability and if it will be the right seat for you. If you have landed here and all you want to do is buy the Brondell s1000-ew swash 1000 toilet seat then you can check it at Amazon.com.. by clicking on the button below. Note: If you just want to buy out the top pick of the best electric bidet toilet seat or read our in-depth review then make sure you take a look at SB-1000 Smart Bidet toilet seat. 1.6 Will the bidet seat fit my toilet? 1.8 Where to buy the brondell swash 1000? When you experience the luxury of using warm water to cleanse with you will agree, there’s no turning back to using rough as toilet paper or expensive baby wipes. The technology that the swash 1000 comes with still continues to impress those who have one with like a complete home spa feeling. 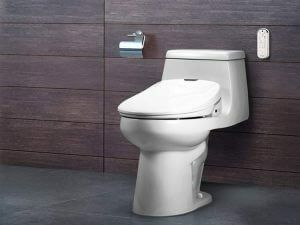 Loaded with all the luxury features you’ed expect from a high-end electronic bidet seat. From endless warm water washers to warm air dry to complete the job with a smile and satisfaction. There is nothing worse once you got used to using a bidet is going back to paper right? And what’s worse then that is having warm water and halfway through the cleanse it turns cold. Well not no more, the brondell swash cs1000 has an endless water heating system in it. All with just a touch of the button. This provides endless warm water on those cold wintry nights when the business is done and it’s time to get of the throne. And when it is time to cleanse and finished with the wash a nice warm dryer is there it complete the job of nicely. Warm water to wash with and warm air to dry. Just perfect for the winter months☺. No high-end electronic toilet bidet be complete without cleanliness. The nozzles are made of the highest quality stainless steel, which makes them more durable and hygienic than plastic nozzles. For extra peace-of-mind, the nozzles can be sterilized at any time using silver nanotechnology. With more setting then you can poke a stick at, you can fully customize the settings for your own comfort and liking. Need more powerful clean, adjust the setting. Want a softer spray then all you have to do is adjust the setting and it’s all good. Will the bidet seat fit my toilet? One of the biggest mistakes a lot of peeps make is not knowing what toilet seat they need. Below I have included some basic measurements so when you order your seat you know you either need round or elongated. It’s not hard to as you can see and unless you do it quite often it’s pretty hard to tell just by looking at your toilet bowl. As they say “measure twice, cut once”. Installation is quick and simple. Designed to be installed by anyone in a few simple steps, it’s easy to self-install on your existing toilet in under an hour. The Brondell swash s1000 bidet toilet seat is an excellent choice. 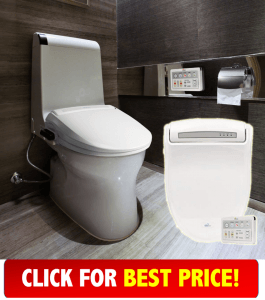 – if you did not like our top choice which was the SB-1000 Smart Bidet toilet seat you should certainly check this choice out. With over 450 reviews on Amazon.com from customers who have purchased. The majority of the reviews are either ⭐⭐⭐⭐ or ⭐⭐⭐⭐⭐ star rating. Of course, there are also ⭐ and ⭐⭐ star reviews too. They mainly are for not lasting long enough, some of these reports were like 3 and 4 years later saying broke after 3 years, etc. Others said were missing parts or it didn’t fit correctly. In saying that I don’t think you should worry about these few bad reviews as out of over 450 reviews 377 are positive reviews. Where to buy the brondell swash 1000? ATTENTION: If you’re only skim reading this review this is the most important part in the whole post. You want to make sure you get the real deal, the best price and not damaged with a good warranty. You will be able to see that you can purchase the brondell swash 1000 from various outlets however, you don’t want to pay over the top prices for it either. Be careful if you’re able to pick a cheap one up from eBay but you can also find that it’s missing parts once you get it or damaged, worse you do not end up with the delivery! We highly recommend that if you want to Brondell S1000-EW Swash 1000 Advanced Bidet Elongated Toilet Seat you order from Amazon.com below! At the moment you can pick up the brondell swash 1000 for just $578.60! This is liable to change as the prices will move up and down but that will give you a 30% saving of $80 at the time of writing!